Can-Do’s Double Sided Cloth Tapes have a strong cotton cloth carrier, but they accommodate irregular surfaces. Their rubber adhesive bonds immediately and maintains the integrity of the bond. Double sided cloth tapes are recommended for indoor carpet installation and carpeted stairways and for various industrial mounting applications. Some cloth tapes are pressure-sensitive, which means that they are designed to adhere with pressure, not with an adhesive. These tapes are useful in projects where things need to be held together without leaving residue behind. Others can use a variety of adhesives, along with coatings which make the tape waterproof, fire-resistant, or otherwise distinctive. 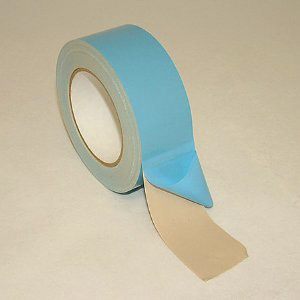 In hospitals, cloth tape is often used for bandages, as it will bend and flex with the body, and pressure-sensitive dressings can be used to gently cover injuries. It is also used to secure intravenous lines, ventilation tubes, and other medical equipment in place, and it may be used to tag surgical scrubs and other equipment, since it is readily available and easy to mark up with pens as needed. On Construction sites, workers use cloth tape to seal up walls, while electricians rely on it for basic rigging tasks. 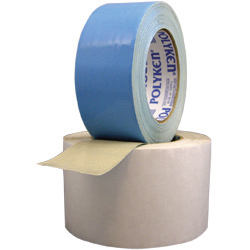 Duct tape is a form commonly used in heating and ductwork, while gaffer’s tape is famous in the electrical community. Plumbers may also sometimes use such products for specific projects.